Canon have just announced the EOS C700 FF, the newest member of its Cinema EOS camera family. Canon’s top of the line EOS C700 will now be available with a full frame sensor in both PL and EF mounts. It is based around a 5952x3140 sensor with a true 17:9 aspect ration. Canon points out that this is the identical image circle as the EOS 5D DSLR cameras. And we should remember that large sensor video acq uisition owes its origins to the venerable EOS 5D Mark II some 10 years ago. The sensor itself has an image aea of 38.1mm x 20.1mm supporting full frame, Super 35mm, Super 15 mm and anamorphic shooting modes. It is compatible not just with full frame lenses but also with Super 35mm glass for 4K/UHD/HD production and with an adapter supports Super 16mm lenses for 2K/HD sizes. The 5.9K sensor oversamples 4K DCI or 4K UHD to reduce moire and noise while enhancing image sharpness. Dynamic range is touted as “exceeding 15 stops” when recording in Canon Log2 and BT.2020 gamut. Canon recommends Log2 for HDR creation for highlight and shadow details. The C700 FF records either Canon XF-AVC or ProRes to CFast cards. The initial release will allow HFR recording up to 168fps in 2K crop. Additional formats will arrive with future planned firmware updates which are not specified at this time. Canon has partnered with Codex to integrate the docking Codex CDX-36150 for RAW recording at 5.9K up to 60fps, 4K RAW up to 72fps, 4K ProRes up to 60fps and 2K ProRes to 168fps. It also supports the most recent version of ACESproxy. Body and controls remain identical to the current production C700. 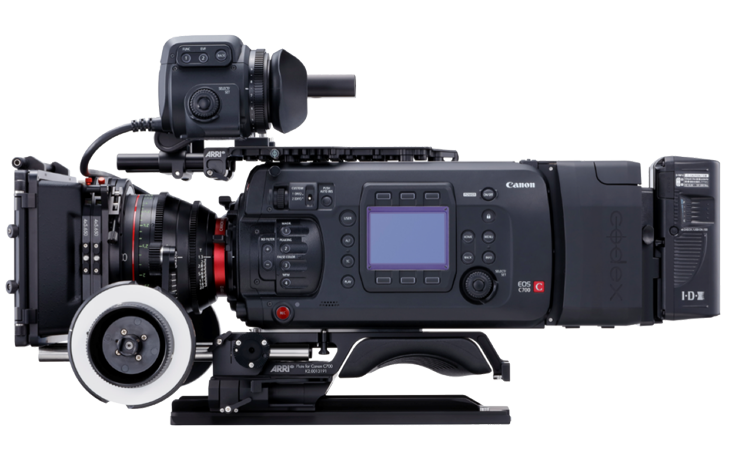 As an added incentive, current C700 owners can send their cameras to a Canon authorized service center to upgrade the sensor block to the 5.9K full frame sensor. Pricing and availability are to be announced. The C700 FF in both EF and PL will be available in July 2018.